I am not a religious man, although I have a system of beliefs. I do not always share my feelings at work, but at one point in my career, had allowed myself to develop an emotional callous in order to block out the negative experiences associated with working in an emergency department (ED). This is an occupational hazard, I suppose, but it enabled me to compartmentalize, adjust, and deal. Certainly, I’m not the only person with this malady, though at one point in my career it led to a cynicism that quickly approached burnout. That is, until I had my Miracle. Let me explain. The ED in which I have worked for 17 years is very busy, and the population in the area continues to grow. The catchment area is many square miles, and at the edges it can be a 45-minute ETA to the hospital. Designated as a Level II Trauma Center, the ED is also Emergency Department Approved for Pediatrics by the Department of Health Services in Los Angeles County, and as such, we see 12,000 children a year. Very often, they come in quite sick. As any emergency nurse will tell you, when a critically ill child arrives, people hold their breath, and a seriousness takes over as many disciplines come together to save the young one. When a child dies, it is particularly emotional. There is a great deal of research regarding stress, burnout, and compassion fatigue among healthcare workers. Everyone deals with this in their own way; I had hardened to even the image of a child in cardiac arrest and the heroic efforts of resuscitation by the fire personnel. To make matters worse, I did not even consider the harshness of my own words. Like clockwork, 45 minutes later, the sound of the ambulance backing up to the doors was heard. I had already moved on, both physically and emotionally, to another of the never-ending tasks in the department. As the gurney wheeled in, the first thing I noticed was there were no EMTs performing chest compressions. “See”, I thought, “even they’ve given up.” Not so fast. The reason CPR was not being performed is the baby had a pulse. Unbelievably, she was not dead! I immediately remembered my uttered challenge and was privately embarrassed for my cynicism. But whatever incorporeal being in charge of the metaphysical space, where all matter is interconnected, wasn’t finished with my lesson, for not only was the baby not dead, her first name was Miracle.Miracle!I weep even now as I write about it many years later. Not only was she alive, but her name was so specifically tied to my challenge; it was hard to pass it off as coincidence. Miracle was so-named because she had survived a congenital defect of the heart and numerous surgeries to correct the problem. To her foster parents, she truly was a miracle. She was stabilized in our department and waited many hours for transfer to a pediatric facility. Every time I went on the patient tracker, I was reminded of my caustic comment and the clear message I had received about challenging God. Miracle was transferred to a pediatric medical center where she passed away the next day. The more scientific among my colleagues, or perhaps just burned out like I was, focused on the fact Miracle did not survive her illness. I like to think she was kept alive for no other reason than to teach me a lesson about compassion, empathy, and keeping in touch with the humanity of those entrusted to our care. Although she had only lived for 18 months, this Miracle marked the beginning of my emotional recovery. 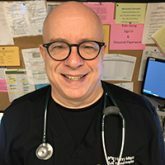 Joseph Greene is a clinical navigator for the emergency department at Henry Mayo Newhall Hospital in Valencia, California. God works through us and in us. “Religion” is our way of formalizing our relationship with Him. Your heart cried out in pain and discouragement, and God answered. Joe, I bet you are an awesome caregiver, and I wish you much peace and healing in your work. Thank you for your honesty, Joe! I can relate to your description of the emotional callous. Well written, I am thankful for this experience and your willingness to share it!